Seattle-based opera singer/novelist Louise Marley knits together two related plot lines — a contemporary story about a therapist in deadly peril from a patient, and a domestic drama in the life of opera composer Giacomo Puccini — into a gripping novel about obsession and its consequences. A compelling mystery and crime drama unfolds as Tory Lake tries to build a new life for herself as Paulette Chambers. Tory, a Vermont therapist, is desperate to protect her son from a client who has gone unhinged. She flees across the county after an accident in which it appeared she did not survive. Guided by her “fey,” a sense of intuition that she uses to help guide her life, she tries to begin anew in Oregon. Tory has a series of dreams about Donia, the housemaid of composer Puccini and his difficult, vindictive wife, Elvira, are interspersed within the action of her waking life. A glass butterfly heirloom appears in both narratives, adding a concrete connection between the parallels of the stories. Tory loves opera, and this thread weaves the pieces of the book and her life together. The pace of the novel continues to pick up as the strands of the story fall into place. After her initial trauma, Tory begins referring to herself as Ice Woman. As she interacts with the mix of quirky new characters in her life, she thaws and comes to terms with what it will take to rebuild her life. The author parses out details about Tory slowly throughout the book, creating a richer understanding of the character and her motivations. The tension ratchets up as her new and old life converge when both her son and vengeful patient discover her whereabouts. The writing is lovely in this engrossing read. Ages 17 to Adult. Four Stars Marley's latest is a poetic blend of historical fiction and suspense. Readers are kept waiting anxiously in the dark for details behind Tory's escape, which are revealed little by little throughout the novel. Marley also awards readers with a book-within-a-book bonus, and a glimpse into the life of the renowned opera composer Puccini. Beautifully written and intimate, the endless intrigue and mystery in this novel will keep readers on their toes and eager to reach the conclusion. This is a terrific suspense that blends a touch of the Fey with the life of Puccini inside of a taut contemporary thriller. Fast-paced, fans will appreciate the son and the villain searching for the therapist as all roads converge on Cannon Beach.
. . . a slipstream offering that might stymie readers intent on easy categorization. . . a good thing, too, because the result is worth reading. Marley does an excellent job capturing the experience of starting a new life from scratch, and how human (and, memorably, canine) connections insist on forcing their way into the life of a woman who has, for a time, persuaded herself that she's better off alone. It's really a book about those connections, and how Tory can benefit by not making the key mistake of that servant girl whose life has been so strangely connected to hers. The tone is literary, the language rich, and the feelings wrapped up in Tory's intense love of music--and her unresolved relationship with the estranged son she left behind. Plus, there's that dog. Marley’s novel could easily be classified as a mystery; however such a limited perspective would minimize the intensity of the emotional elements. This is a story of developing self-awareness for Tory and her son, Jack. As Jack begins to accept the feeling of the fey within him, he commits himself to denying his mother’s death, persisting in trying to find her so he can repair their relationship. The supporting characters illustrate the meaning and depth of friendship and love. 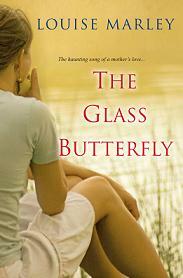 Structurally, The Glass Butterfly is a superb example of writing. Marley excels at setting rich and colorful scenes. The characters are well-developed, enticing readers to connect and invest in each and every one of them. Although the pacing wanes a bit in the middle, readers will be unable to let go of their emotional ties, desirous of wanting to know the final outcome.